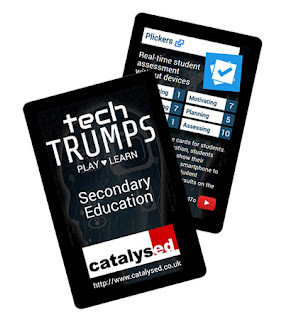 My Tech Trumps® are a funny beast, they seem very popular with teachers but I think sometimes people miss the point behind them, and the research that led to them ... so I thought I'd write a quick post to clarify their history and purpose. In a hurry? Skip to the 3 steps. The Tech Trumps® are derived from my research in ecological psychology, perhaps not the most well-known branch of that discipline, but a very important one nonetheless. Ecological psychology considers the wider system that humans exist within, and treats cognition as something that exists not only within the individual but also as something that extends into the world. Humans are not separate from the world, detached entities that can always maintain a controlled and isolated existence, but are much more deeply integrated and affected by what happens around them in and across time. I like to think of it as a sibling to the theory of connectivism (or maybe even it's father?). Think of that for a moment from an educators perspective, and a learners perspective. It reinforces all we know about the importance of context, of the importance of others, and the problems of transference within learning. An ecological perspective can be a powerful lens through which to reflect on different learning interactions, such as teacher-learner, learner-learner, or learner-object, and how those interactions impact the individuals concerned in and across time. Are they fixed moments of transmission or ongoing exchanges of perspective? When does 'learning' actually take place, at a precise moment or gradually over time? What has actually been 'learnt' - a piece of data, or a connection between something that is known and something that is unknown? For me, the ecological perspective brings back a certain fuzziness to pedagogy - but I would argue that's no bad thing. The bare truth of the matter is that teaching and learning IS a complex and somewhat chaotic process, and people who try and tell you otherwise are either ignorant of that complexity ... or perhaps trying to sell you something! Within ecological psychology there's a specific concept called 'affordance'. Basically, this is what something in the world "provides or furnishes" us, the value that it has for us. It's a relative term, relative not only to specific individuals but also what they're trying to achieve at any one point in time. Traditionally it has been defined as the 'interaction possibilities' provided by an object in the world, but my own work challenges that and suggests that a more accurate definition is the 'transaction possibilities' that are provided. If you'd like to know more about that, I'd recommend you have a look at my doctoral thesis (in particular the concluding chapter). So what does all this have to do with the Tech Trumps®? Well, the challenge that I've always found with digital technologies is that they just seem so opaque to people with no experience of them - especially with all their odd names! 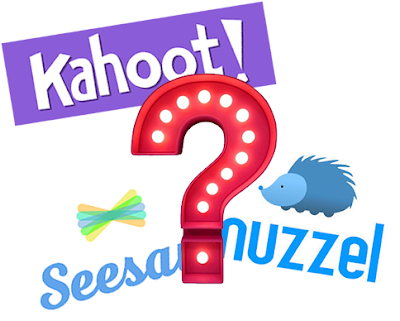 If I rattled off a few names at random, for example, let's say Kahoot!, Nuzzell and SeeSaw, most people would be absolutely none the wiser what on earth they might do for you - i.e. what their affordance is. They're just odd names, easy to ignore, and hence very hard to integrate into teaching and learning. I've been exploring this problem for over 15 years now, and I've seen it again and again in education, whether at University level, Secondary or Primary. The problem is always the same: there are loads of great apps out there, and lots of teachers that could take advantage of them to catalyse their teaching, but it's that last connection that fails - app and teacher (or, more to the point, RIGHT app and RIGHT teacher). Yes, other barriers to effective use do exist - badly set-up wifi, missing policies and practices, out of date hardware, etc. - but often those are relatively simple to fix. 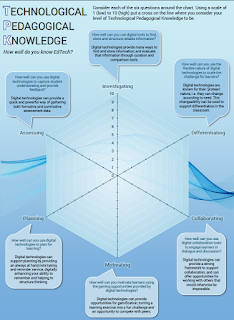 What's missing is the final part of the jigsaw, the part that links an individual's needs with the digital technologies most able to support those needs. 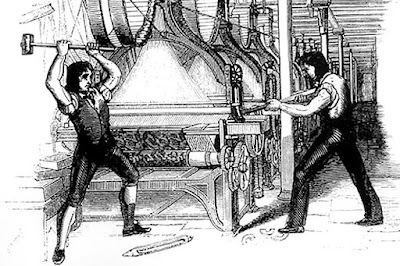 That's where my tools and techniques come in, and the Tech Trumps® in particular. They provide a proven process that allows individuals with little experience using digital technologies to discover the affordances of specific apps in their own contexts. It's something I call the APT methodology, short for the Alignment of People and Technology. By following my process educators can rapidly see how a particular tool has the potential to support what they're trying to achieve in the classroom. 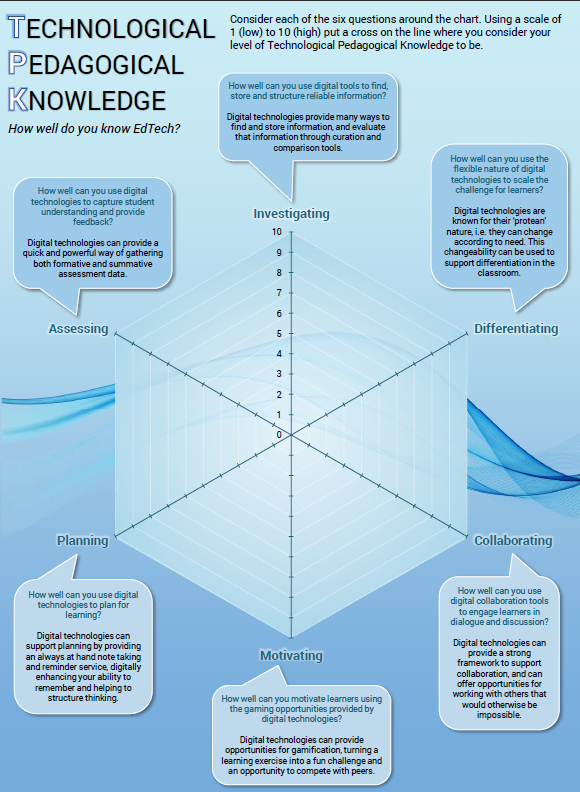 Step 1: Take the TPK quiz to get your Technological Pedagogical Knowledge score across six dimensions of teaching with technology. Step 2: Add the scores from your TPK quiz to a TPK model and use it to identify your development needs. Step 3: Use the free Tech Trumps® browser to select digital technologies that match your needs. Read their descriptions and their video links - and pick one to integrate into your lessons. And all for free! I do provide consultancy for schools, including analyses of existing practices, design and development workshops, and implementation support, but at the same time much of what I've developed is available for free. As an education researcher I'm committed to exploring ways of improving and developing on these tools and techniques, so would love to hear back from anyone trying them in practice, and am very interested in developing professional relationships that would see them tried in more contexts. If you'd like to know more about these ideas, or fancy a deeper chat about what I can do you and your school, please get in touch.